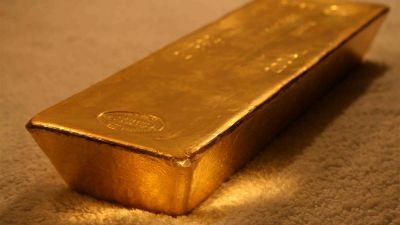 Our base-case fair-value for gold is broadly flat over the coming year, as support from rising inflation will counter the downward pressure from rising interest rates. Despite policy interest rates rising in 2017, the US Dollar has depreciated and US Treasury yields have declined. We expect these paradoxical trends to abate in 2018. Most of the variation in gold price in our bull and bear cases (compared to our base case) comes from assumptions around investor positioning. Many measures of market volatility are currently subdued. However, several risks – both political and financial – exist. Sentiment towards gold could shift significantly depending on which of these views dominate market psyche. We believe that in addition to the fully-priced-in December 2017 hike, the US central bank will follow through with three further rate hikes in 2018. That comes on top of the balancesheet run-off that the Fed has already announced. Although some market participants think that under a new Chair, the Fed will become more dovish, we believe the central bank will remain data-dependent and trained staff economists’ analysis will become more influential in the Board’s decision making. In light of strengthening domestic demand and a tight labour market, the inflationary potential will be hard to ignore. Inflation has been subdued in 2017, despite so many signs of cyclical strength, but a large number of idiosyncratic factors account for this apparent weakness in price movements. Dominant wireless phone service providers changing pricing; solar eclipse changing the timing of hotel stays; severe hurricane disruptions; budget airlines opening new routes are some of the idiosyncratic factors that are unlikely to be repeated. Also the calculation of owner occupied equivalent rent has caused some distortions in the inflation numbers as it is sensitive to energy prices. 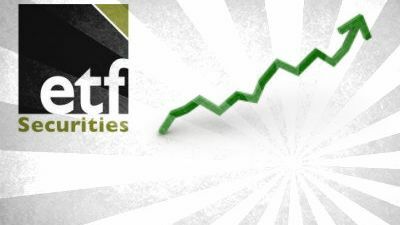 With volatility in energy prices having fallen, we expect these distortions to subside. The unemployment rate is at its lowest in 16 years and a healthy number of jobs are being added every month (notwithstanding hurricane disruptions). The strength in the labour market is now likely to show up in inflation as per its traditional relationship2. We expect US inflation to rise to 2.4% in June 2018 and 2.6% by December 2018 (from 2.2% in September 2017). These levels will likely be uncomfortably high for the Fed, but given the lags in policy and price response, there is little the Fed can do next year to stop it (the inflationary pressure has been built up this year). 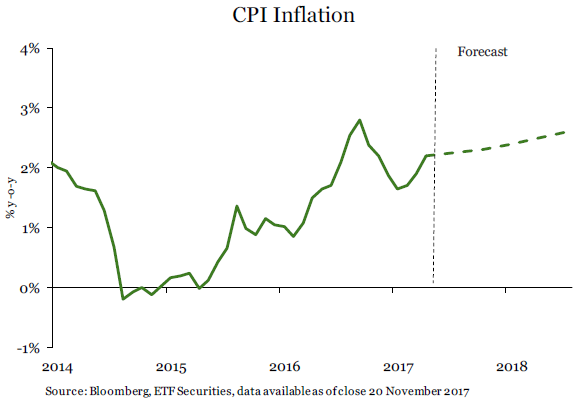 However, we believe three rate hikes in 2018 will be required to keep inflation expectations sufficiently anchored. During the rate tightening that has taken place in 2017, the US Treasury yield curve has flattened. While there have been 75bps of policy rate increases since December 2016, nominal 10-year Treasury yields have fallen from 2.60% to 2.34%. We don’t think that 10-year yields can continue to decline. We expect 10- year Treasury yields to rise to 3.1% by the end of 2018. 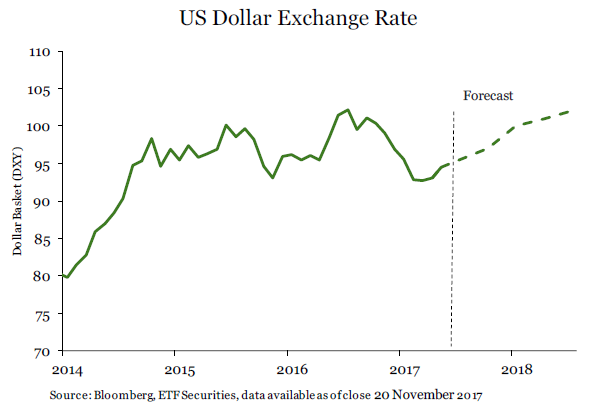 We expect the US Dollar to appreciate modestly (see FX Outlook 2018), reversing some of the weakness that we have seen in 2017. We expect the DXY (the trade weighted US dollar index) to appreciate to 102 by the end of 2018 from 94 currently. A lack of progress in implementing pro-growth policies that the Trump Administration had promised, a lack of tax and budget reform and a generally stronger Euro and Yen have weighed on the US Dollar in 2017. Some of these trends will continue to drag on dollar performance in 2018, but rising interest rates will lend some support. We believe that the policy divergence between the Federal Reserve, European Central Bank and Bank of Japan will become more pronounced as the market becomes increasingly disappointed by the pace of tapering by the latter two central banks. That will reverse some of the strength in the Euro and Yen. We expect CFTC futures market positioning in gold to hover around 120k contracts net long, lower than current positioning (190k), but marginally higher than the long-term average positioning of around 90k contracts net long. Currently positioning is elevated due to investor fears around continued sabre-rattling between US/Japan and North Korea and some of the tensions in the Middle East. These concerns could fall away if new developments on these geopolitical issues do not resurface. We have observed that when such geopolitical issues simmer in the background, political risk-premia tends to dissipate from the price of gold. It requires keeping the issues at the forefront of market psyche for the premia to endure. Our bull case for gold assumes only two rate hikes in 2018. As a result the DXY only rises to 99 and treasury yields only rise to 2.8%. We assume that inflation rises to 3%. 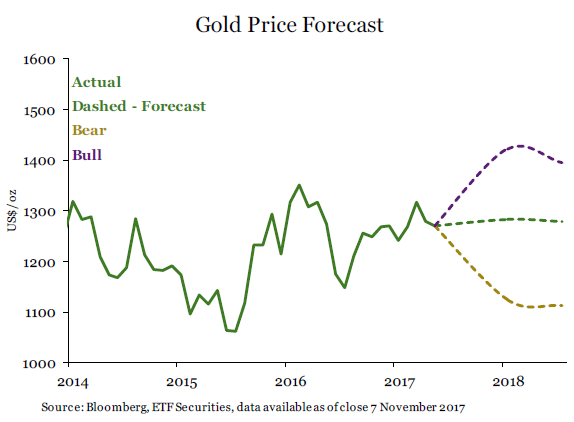 In the bull case scenario, gold will rise to US$1420/oz by the middle of the year, and ease to just below US$1400/oz by the end of 2018. In our bear case, we assume the Fed delivers four rates hikes in 2018 as it tries to anchor inflation expectations. 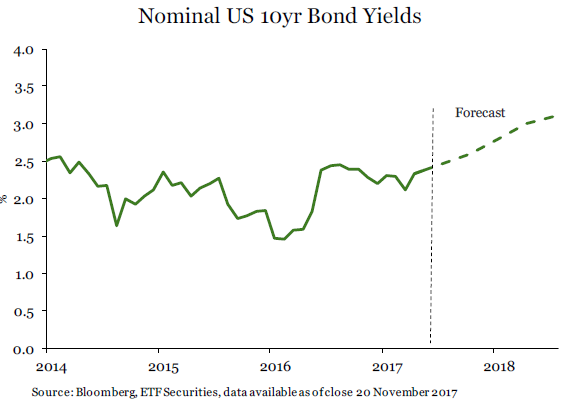 10-year nominal Treasury yields rise to 3.3% by the end of the year, while the DXY appreciates to 105. By year-end inflation falls back to 1.6%. In this scenario we assume that the absence of any geopolitical risk premia or adverse financial market shock and so speculative positioning falls to 40k contracts net long. In the bear case scenario gold falls to US$1110/oz by end of 2018.